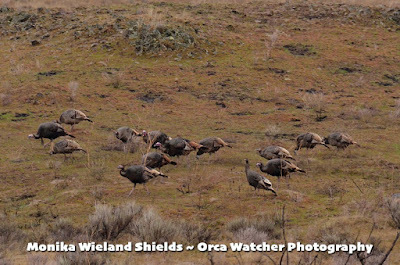 Last weekend my family and I went out on a birding trip in southeast Washington/ northeast Oregon with Khan Tran of KTBirding. 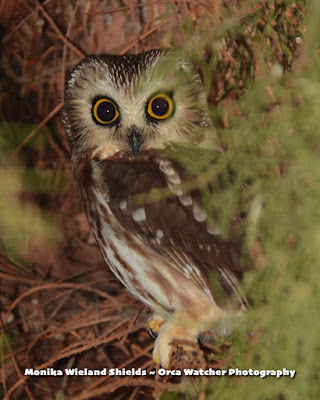 It's a trip my dad and I have talked about taking for years, reading with longing his regular trip reports that listed many potential life birds for both of us right here in our home states. 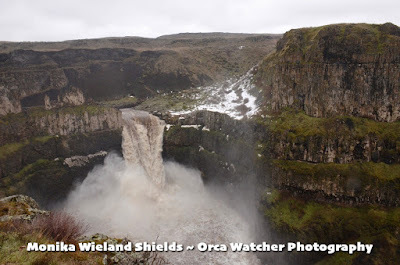 Our initial trip plans got postponed due to weather, but thankfully, we finally made it happen! 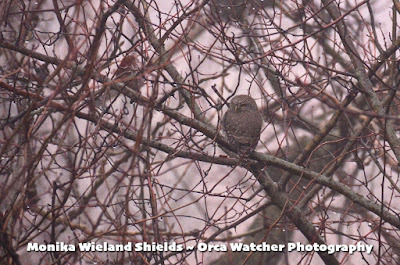 It didn't taken long fro Khan to impress with his birding skills, as practically the first bird of the day was a northern pygmy-owl he somehow spotted as we drove up to higher elevations near Walla Walla. First bird of the day, first life bird of the trip for me! 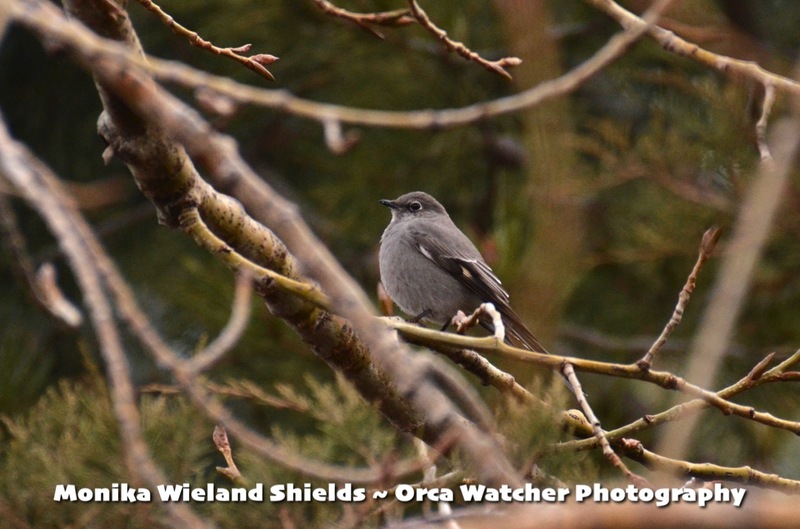 While we didn't spot any hoped-for great gray owls, we did see some other new species for the year. 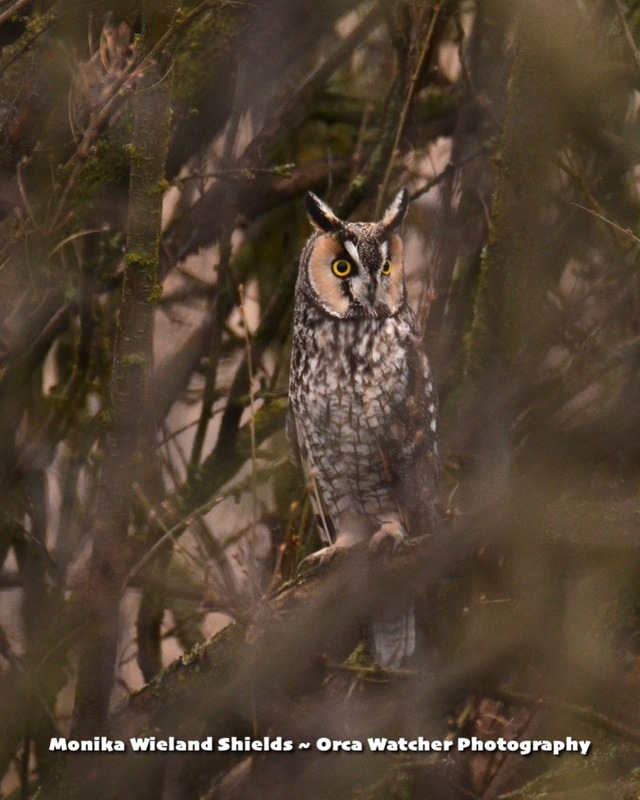 Back down at lower elevations, we picked up our second owl species of the day when we checked out some long-eared owl roosts. It was incredible in that Khan knew they were likely there, but on our first pass by, no one saw any owls. On our second pass, Khan spotted a couple, and even when he pointed out right where they were it took a few minutes for the rest of us to see them. Talk about camouflage! Then the more we looked, the more we started seeing! There were at least a dozen birds in the first roost we saw, and we ended up seeing an astounding 30 or so of them as we checked several other roosts. And that's just the ones we saw - we could have easily missed twice that many for how hard to see they were! 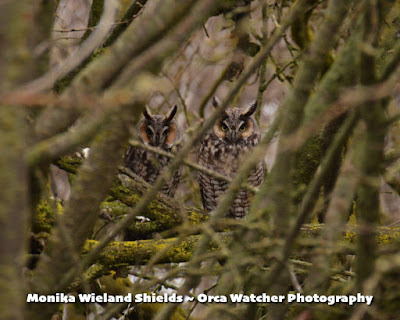 Next we went to look for northern saw-whet owls, and en route spotted a pair of great horned owls - third owl species of the day! What are you looking at? 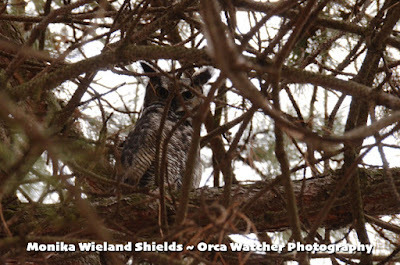 You, you great horned owl! And sure enough, we found two saw-whets, too - an amazingly tame wild bird! 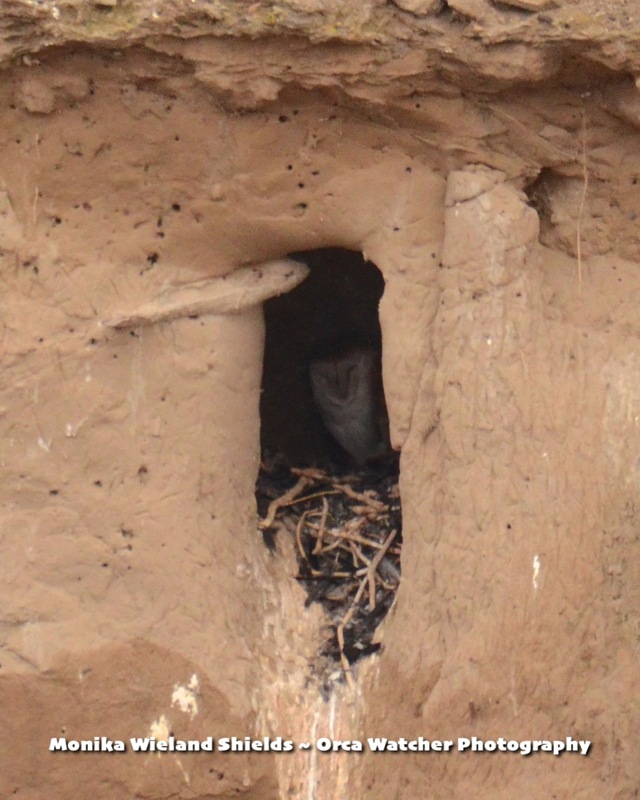 On a roll now, we made a slight detour to look for a roosting barn owl, and found one. 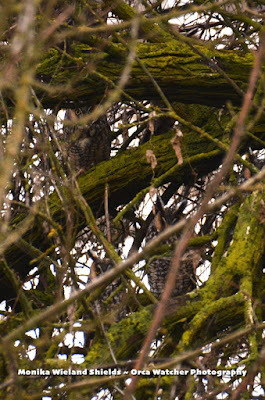 Not exactly a great photo op, but the first barn owl I've seen in many years and owl species #5 on the day! Roosting barn owl - photo year bird #111. Who made that owl-sized hole in the cliff, I wonder? 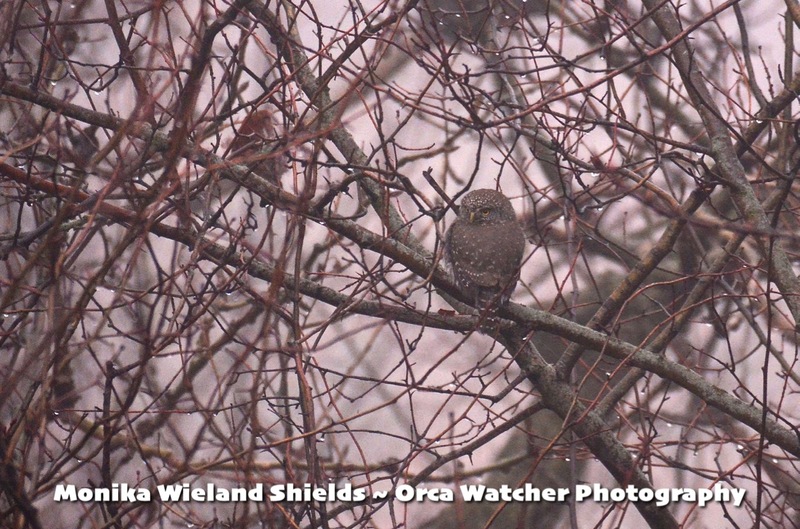 The drizzle started falling and the fog moved in again, which slowed down the birding during the mid-afternoon. 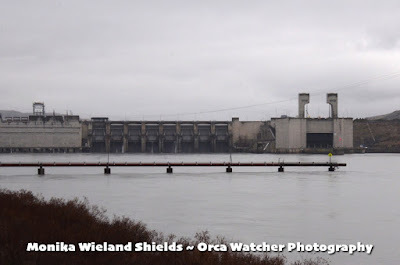 While in the area, we made a brief stop at Lower Monumental Dam - one of the four Lower Snake River dams that have received so much attention lately among the whale and salmon community. 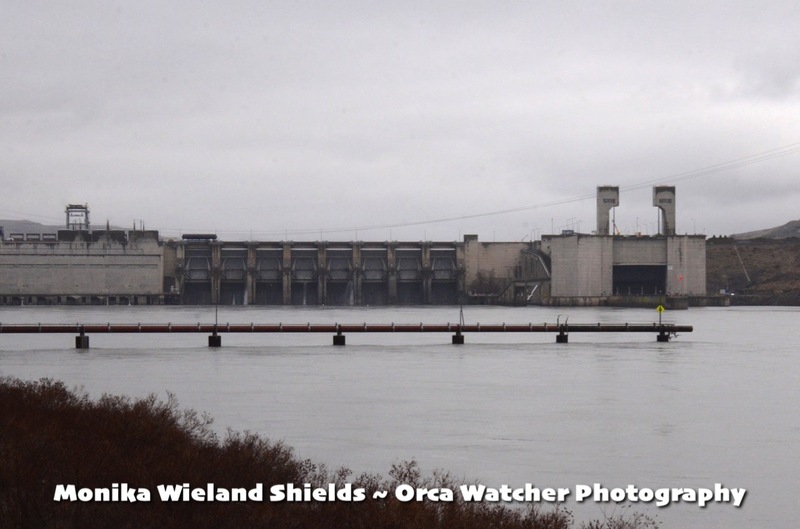 I can see how people living in the area aren't aware of the connection between these dams and the endangered Southern Resident Killer Whales that live so far away, but the river that runs from one to the other is the direct link. 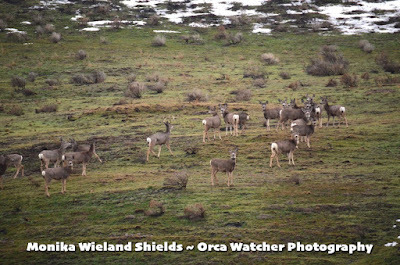 To learn more about why these dams need to go, check out this blog post of mine on the topic. We also made a stop at Palouse Falls, a state park that provided a stunning vista! 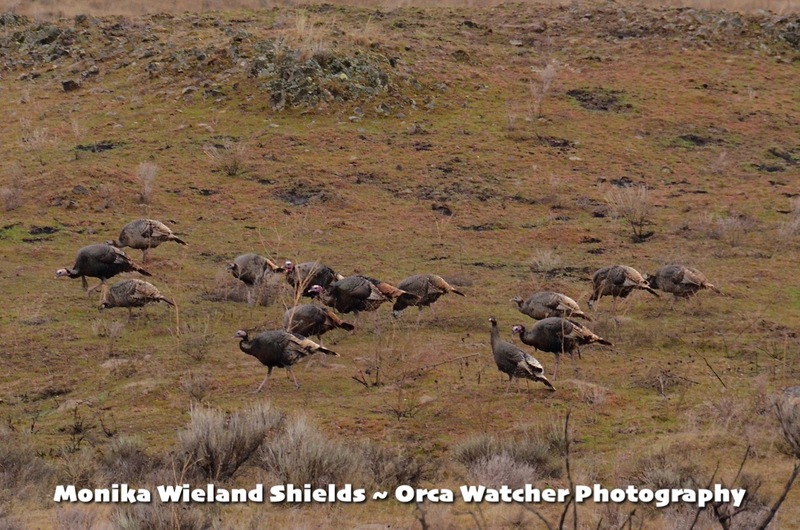 Next we weren't lucky in turning up any more saw-whet owls, but we did find a flock of wild turkeys. 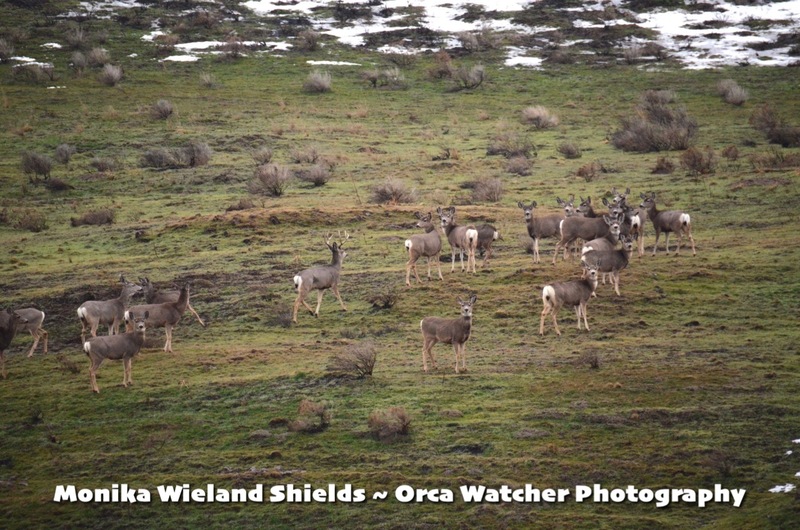 While the focus of the trip was birds, we also saw a fair number of mammals throughout the weekend, including huge herds of elk and both white-tailed and mule deer. 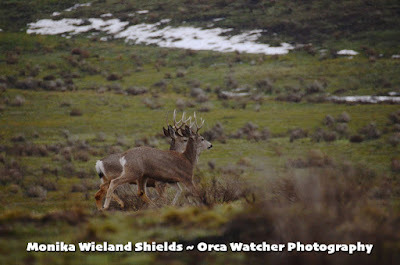 We have our fair share of deer on San Juan Island, but we don't see them in congregations like this! With the light fading, we made another trip up to higher elevations where we had been in the morning, to a peak where locals have seen several pairs of great gray owls this year. The great gray owl is also known as the phantom of the north; it's the largest North American owl but very elusive, and a species I have dreamed about seeing for many years. The snow started to fall and it got darker and darker, and with all of us scanning we made several trips up and down the road to no avail. Hope started to fade as it was nearly getting too dark to see when, on our last pass, Khan spotted it. 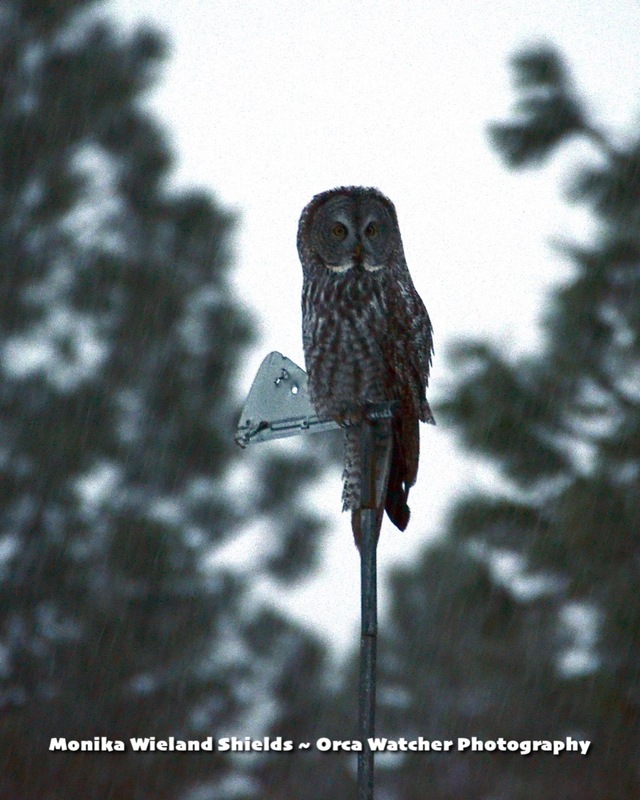 Like a vision through the snow, this male great gray owl lived up to its nickname as a phantom. We all got a good view of it and then it spread its massive wings and disappeared right before our eyes. We headed back to town for dinner, abuzz with the excitement of having lucked out to see this incredible owl species. 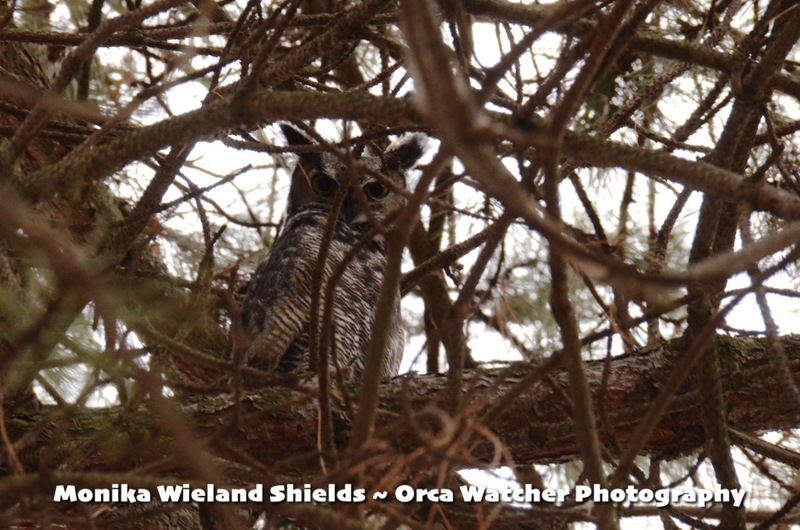 After dinner, we decided to go for owl species #7, and sure enough, we found a pair of calling western screech-owls in a nearby neighborhood. 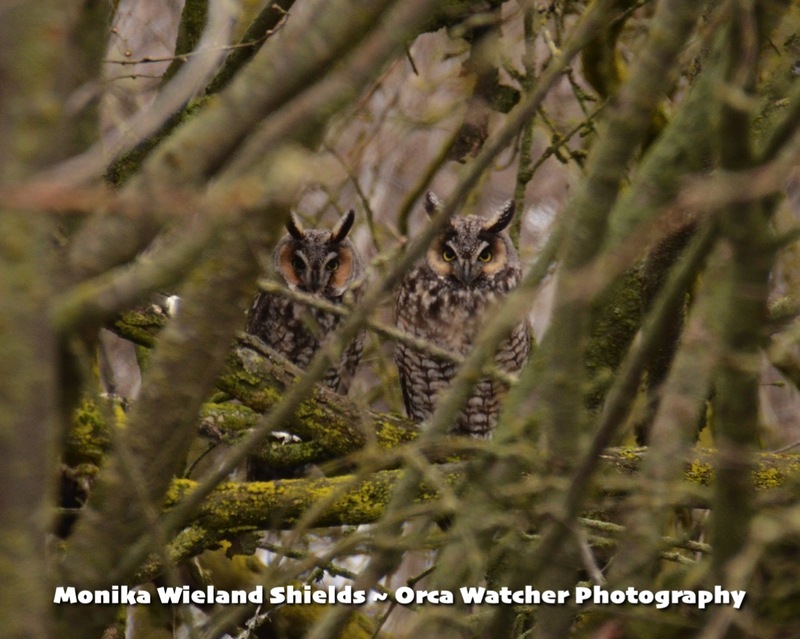 Too dark for photos, but 7 owl species in one day is, I'm pretty sure, a personal record I'll never break! At the end of day one I had added 2 life bird and 11 photo year birds, but we still had another full day of birding ahead of us!